The things that I am going to talk about today are some of the most important things in gimp and with them you can create some pretty awesome pictures. 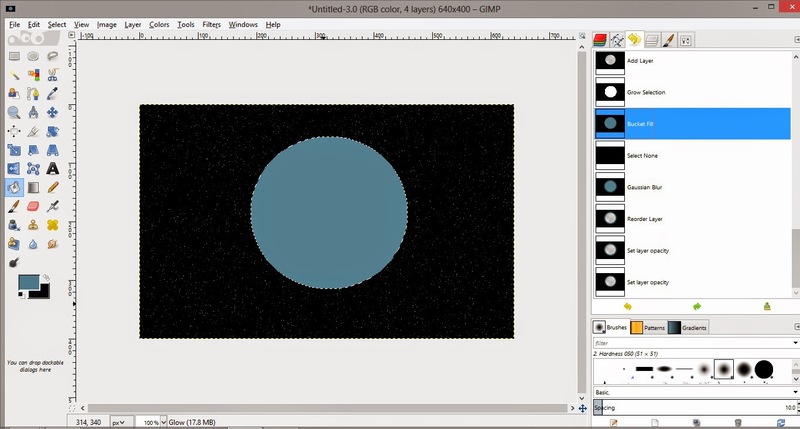 The things about which I am going to talk about is blend tool called gradient tool by photoshop geeks, a tool which blends two colors and filters which takes an input image and then apply some effects to it using some mathematical algorithm. Okay I think that's enough intro, let's get to work now. What I will do today is that I will teach you how to make a moon, clouds and sky filled with stars and the greatest thing about all this is that you need nothing at all except gimp. The first thing you need to do is create a new image and fill it with black color, you can set width of the image as 640 and height 400. Create a new layer by going to "Layer" and selecting "New layer". 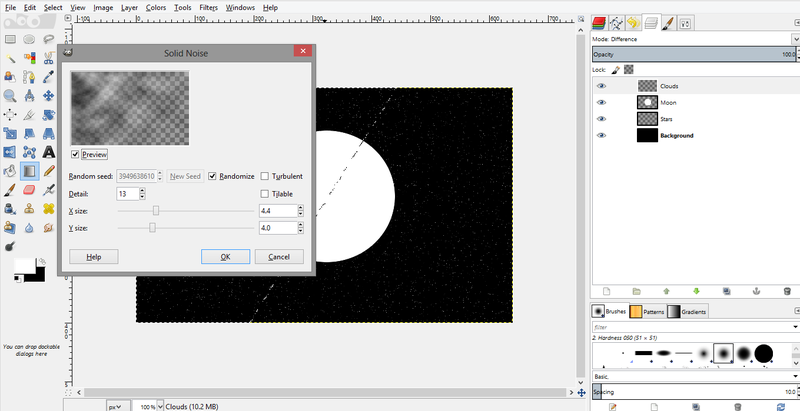 In layer fill type choose "Transparency" and name this layer as "stars" so it is easy to look for it. Now go to filters, from it select "Noise" and select "Hurl" from it.﻿ Check the "Randomize" and choose 1 for "Randomization" and "Repeat". 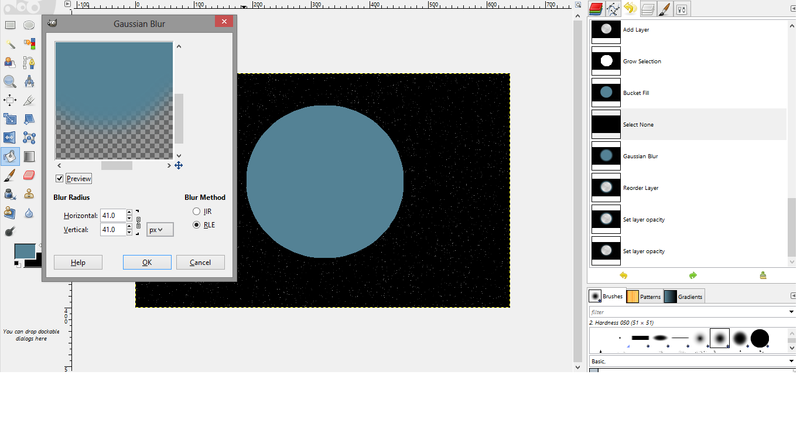 Now go to "Colors" select "Desaturate" and from the dialog box that opens select "Luminosity". Make sure that stars layer has been selected. What are your thoughts about the stars then? 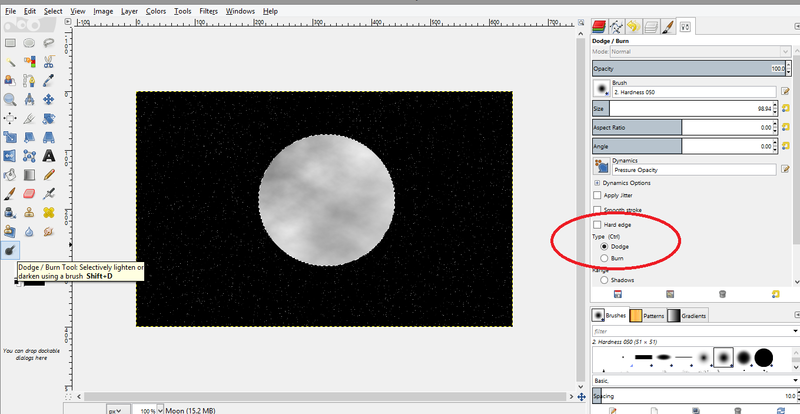 Some of you might think that there are a lot of stars for this I recommend that you choose the "Airbrush" make sure your foreground color is black and the brush hardness is 50 or less and then randomly spray on the image. For me this is good so I won't be doing that. 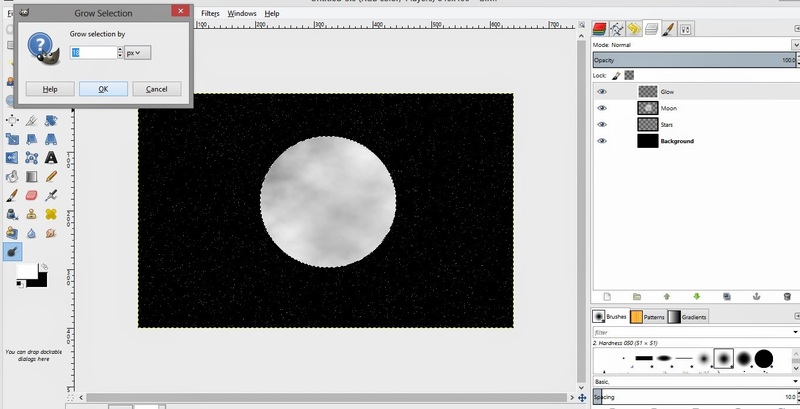 Moving on, again go to layer and select﻿ "New layer" choose fill type as "transparency" and name this one as "Moon". 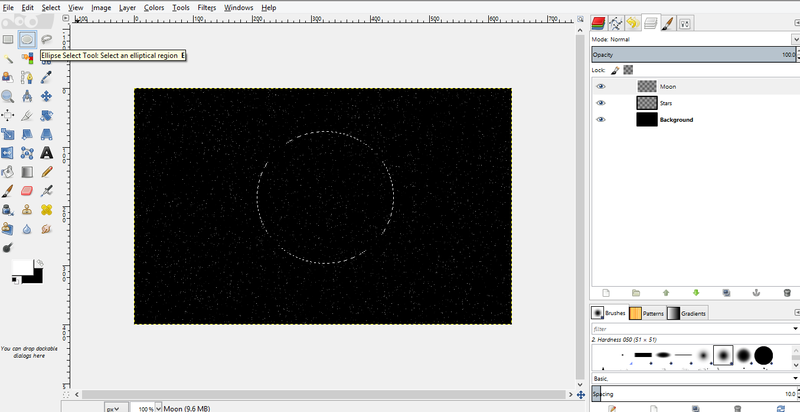 Select the "Ellipse select tool" and draw a circle with it. Fill the circle with white color. Now "Toggle Quick Mask" on, this is a dotted rectangle located at the bottom left corner of your screen and things outside the selection shall become red. I will explain more about quick mask in a later tutorial. Select "blend tool". Now click on top left corner of your image and don't let go, a plus sign shall show up and drag it to the bottom right corner of your image. 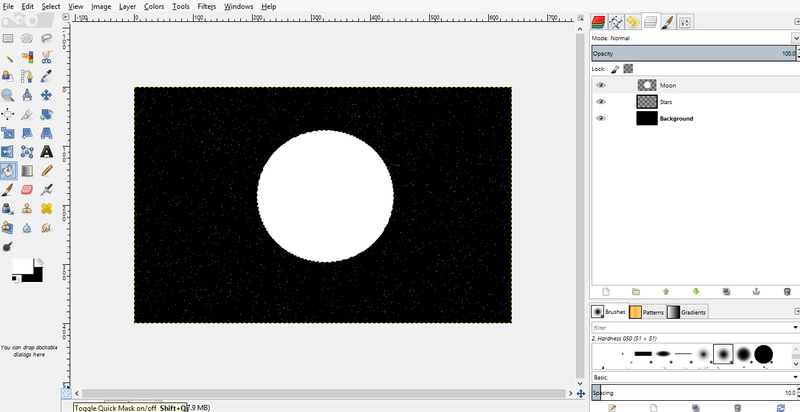 Toggle the quick mask off and something like this should come up on your image. 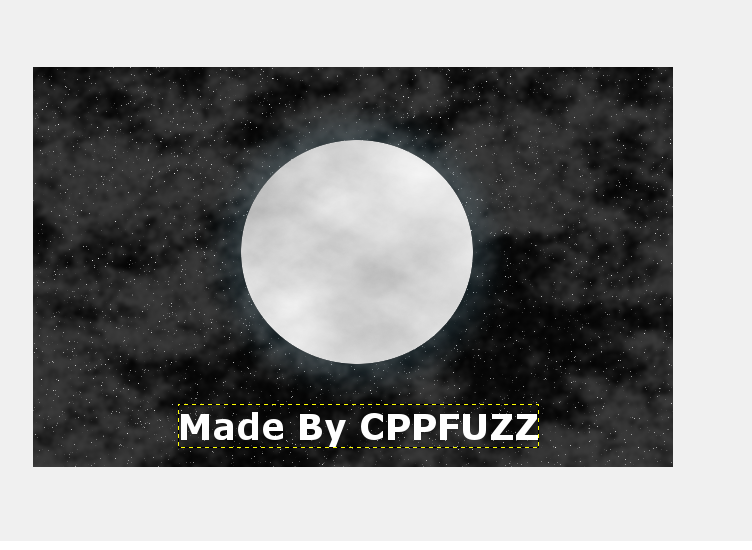 Now go to "Filters", "Render" then "Clouds" and then "Difference clouds". A dialog box shall open up. In it set Detail as 13, X-size as 4.4 and Y-size as 4.0 and check Randomize. If you want you can experiment and see how your end result will look like. Now deselect your selection by going to "Select" then click on "None". Using the fuzzy select tool select your circle or moon again. To me the moon looks a little dull, so what we can do is select "Dodge tool" and make sure that in type "Dodge" is selected. Run the brush on the whole moon and it should brighten up. Well that's our moon except its missing something, if you have a sharp eye like mine than you know its the glow. So let's add some glow to the moon. 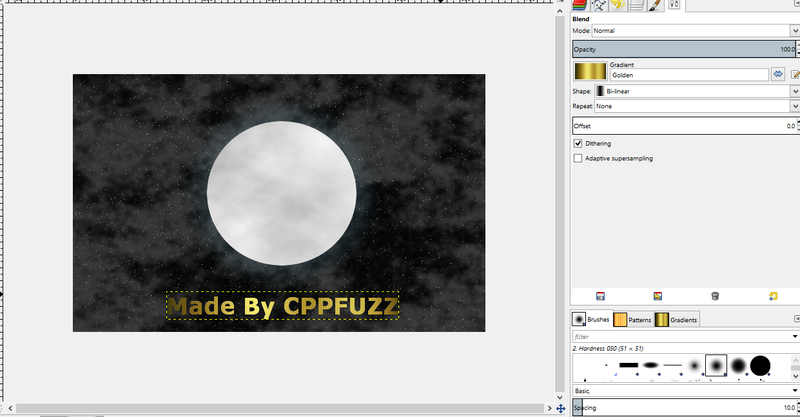 Create a new layer, fill type should be transparent and name it glow. Your circle selection should still be there. Go to Select and click on grow, set the "Grow selection by" to 18. Fill the selection by a bright blue color, mine's 548295 in Html notation and that's hexadecimal. 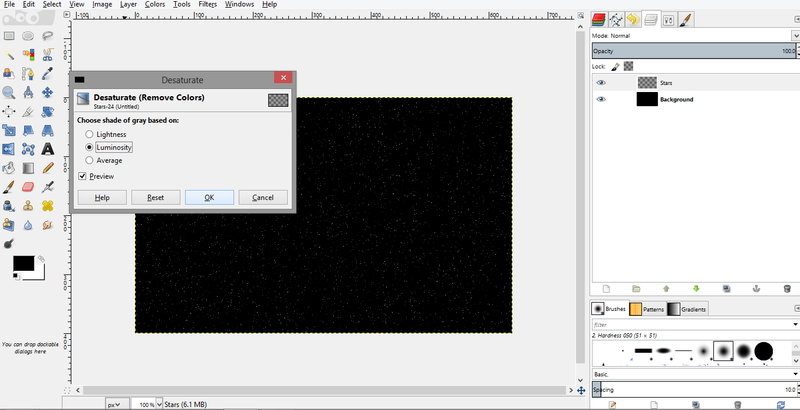 Deselect your selection and go to "Filters", then "Blur" and select "Gausian Blur". Set both the "Horizontal" and "Vertical" to 41. 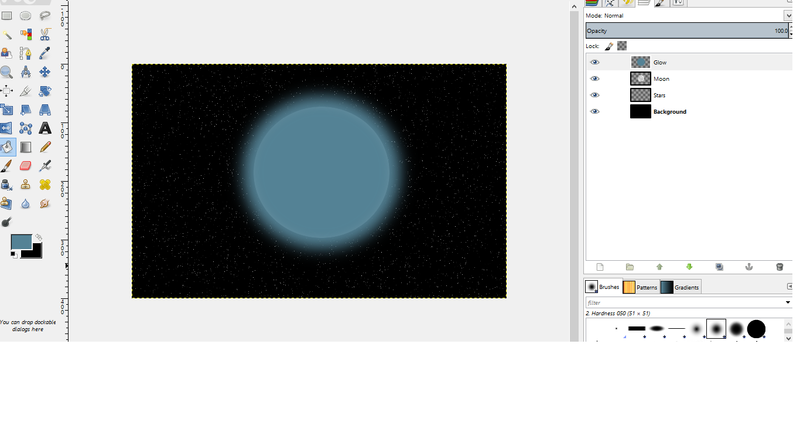 Set the glow's layer opacity to 25 and put it below the moon layer. Isn't it looks cool. 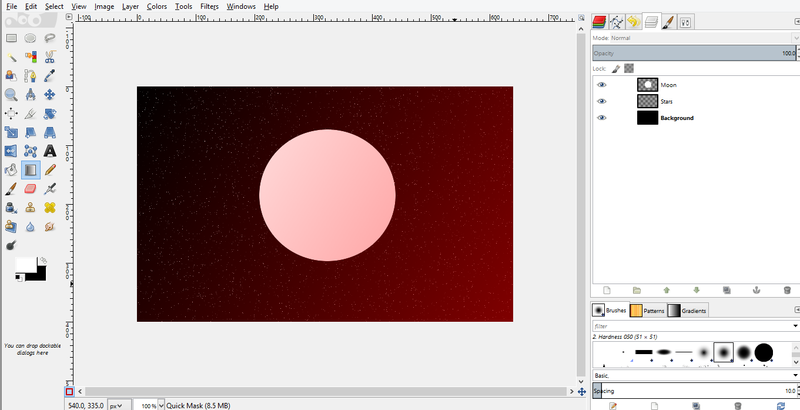 Okay let's add some clouds now. Go to "Filters", "Render", "Clouds" and then select "Fog". 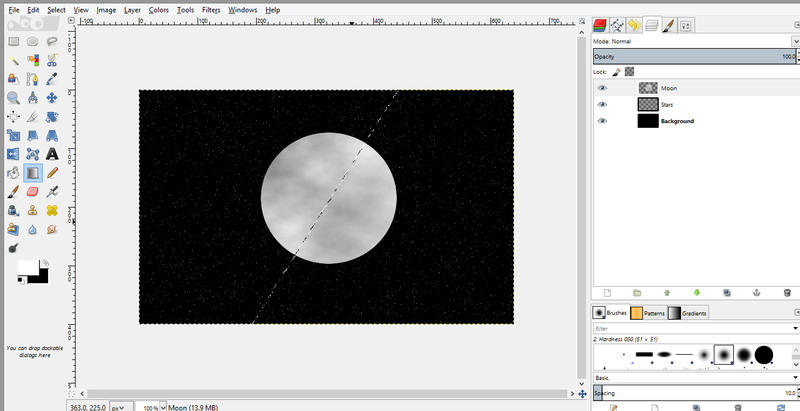 Set "Fog color" as white, turbulence to 6.2 and opacity to 25. Click on "OK". Here's how our clouds look but they kinda look like some comic clouds. Let's blur them so they look more real. 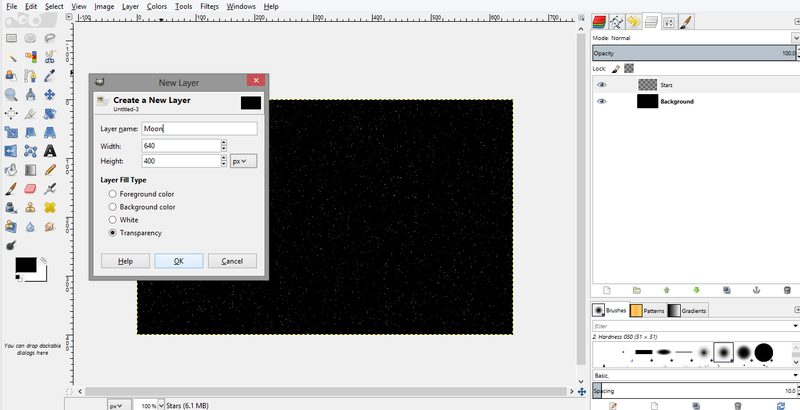 Go to "Filters" again, choose "Blur" and from it select "Gausian blur". Set both "Horizontal" and "Vertical" to 5. It's fancy time now, let's add some fancy stuff to end this tutorial. Select "Text tool" and some text. Right click on the text layer and select "Text to Path". Go to "Select" and choose "From Path". Select "Blend tool" and go to tool options, select a gradient I selected "Golden". Select a shape and then drag on the selection from any two points you want. That's all for today folks, I hope you did enjoyed this tutorial and I would love to hear your feedback and see what you have created. If you liked this, share it with others so that they can learn this cool stuff or share it anyway, there could be a person looking for this but doesn't knows about this site. You could be the guiding angel!